Last year, when I first heard about Disney Infinity, I thought it was a great idea. At the time, my son was neck deep in Skylanders (by proxy so was I) so it just seemed like a natural fit for Disney to create a similar product. Unfortunately, the original Disney Infinity lacked the punch and playability of its competition. It did have the Toy Box, a sandbox creation suite based around the worlds of the Disney characters, but it lacked structured story-based gameplay. In short, it was only mildly entertaining and pretty boring overall. 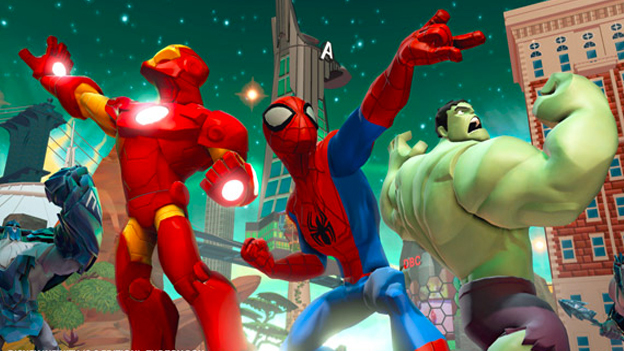 Thankfully, Disney Infinity: Marvel Super Heroes (2.0 Edition) fixes most of these issues. I mean think about it, the Marvel characters are made for action and stories, where the Disney characters were solely created to tell children’s stories, more or less. The original Infinity, while fun to a degree, could never have the amount of action and content that its successor contains. For Example, in a fight who would win? Rocket Raccoon and Iron Man vs. Aladdin and Jasmine. You do the math. The characters of the Marvel universe just make for more exciting and fun gameplay. There are three playsets available at launch: Avengers, Guardians of the Galaxy, and Spider-Man. Each playset has its own unique world to explore, unique characters, and adventures set up and executed in an open world setting that is easy to explore. Think Grand Theft Auto, without all the vulgarity that makes it Grand Theft Auto. Each world has a storyline and mission list to complete, challenges to undertake, and items to unlock. As you collect things from around the in-game world new toys are unlocked for use in the toy box, adding more incentive to go that extra mile to find that hard to get to character coin. Another problem I had with Disney Infinity the elder, was that though you could play with any characters together in the Toy Box, you could not play through playset stories with anyone but the characters in that world. Meaning, you couldn’t go through the Cars playset with Wreck-it-Ralph and so on. This was the main attraction to this game for me upon announcement, and when I found out it wasn’t even a feature I was very disappointed. In Disney Infinity: Marvel Super Heroes, while this issue isn’t completely solved, there are heroes that cross over between playsets. For instance, Iron Man and Nova can be used in all three worlds, because in the Marvel Universe they are in all three storylines. Rocket and Hulk can also pop into the Avengers and Spider-Man playsets respectively. 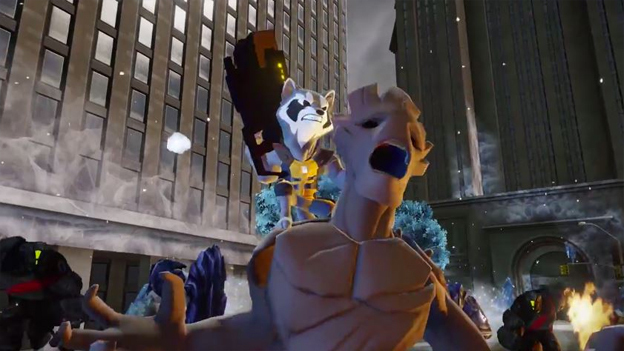 In these instances, you can collect coins in a playset to unlock special missions for an available character, such as Nova or Rocket in the Avengers world. This helps to bridge a flaw of the original game, while satisfying my nerdist sensibilities by keeping characters true to their story arcs. The game itself is much better executed than the original in terms of structured gameplay, but you will need to purchase additional characters to unlock all that Disney Infinity: Marvel Super Heroes has to offer. Some missions require certain abilities to complete, while others are specific to individual characters. In addition to the playset figure that’s required to play in the Avengers World, three major characters are included with the starter pack: Iron Man, Thor, and Black Widow. So you will be limited to missions and activities those characters can complete. However, purchasing new characters will unlock new missions to play through, breathing new life into the game with every purchase. At the center of the business model of Disney Infinity is its character figures, each a standalone hero that tracks the individual progress of that particular hero. For those not in the know, this means that as you level a character up in the game (which is only available if you have the figure) that progress is saved to the figure, NOT the game console. This allow players to share figures or just play together with your favorite heroes. This isn’t anything new to this genre of games, but it’s good to see that this feature has remained intact. Each figure starts out at level 1 and it’s up to you to turn that hero into the character you want to play. The initial control scheme is a bit drab and uninspired, but you unlock new skills fairly quickly that make the characters much more enjoyable to play. Speed and health boosts, new combo moves, and special abilities are all unlocked through a skill tree that has tons of options for any player to create characters they want to play. This means that my version of Hulk and your version of Hulk could play very differently, depending on the skills we choose. This is a page right out of the MMO book, emulating something you would be more likely to see in a game like WoW. But character customization doesn’t hold a candle to the vast creativity that’s possible in the Toy Box. After unlocking things in the game (and in the Toy Box as you play) you can create the Marvel world of your dreams, create mini games, and share them online. Pretty cool huh? This takes a bit of patience, but playing in the Toy Box is a world of nearly endless possibilities.